Our reliable service means our customers only need one taxi service in their contacts – us! Speedwell Cars are one of the best airport transfers providers that travel to all London airports, no matter what time or day your flights. Ordering a Speedwell Car is as easy as downloading and tapping our free smartphone app. The days of calling a taxi and crossing your fingers are gone with our free smartphone app! 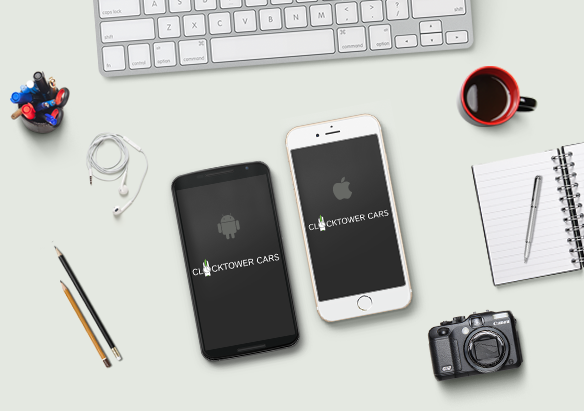 Search for Clocktower Cars in the Apple or Android app stores, download then follow the easy steps to book your taxi. Business class in every sense of the word. Our range is everything any executive would expect and accept. A car with that extra touch of class and comfort. Takes four passengers to their stop in style. Able to carry up to four passengers in comfort with their luggage, ideal for longer journeys. Our fully-trained team are on hand to assist with wheelchair-accessible vehicles. Multi-Purpose vehicle really lives up to its name. Seating up to five people in equal comfort, we use them for business or leisure trips. ideal for groups of up to eight passengers or multiple stops. Whether for a one-off treat or an expectation of constant high quality with every trip, our Luxury vehicle range will exceed your expectations. Just type in your mobile number and we’ll send you the link to download our app. A corporate is the sensible and efficient way of organising your business travel with us. If you are a hard-working, professional driver with experience then we’d like to hear from you. Our team is also recruiting new stars! We get the little and not-so-little ones to school on time and home quickly, safely and regularly. That’s right – we’re a Pet Friendly taxi service and proud of it. We will service Gatwick, Heathrow and any London airport, anytime, day or night. If it absolutely, positively has to be there today, use our official courier service.